It’s always a little strange to start playing a game with an enormous amount of hype behind it. 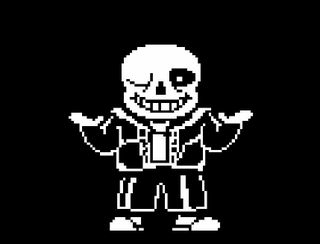 I’ve been hearing about Undertale for what feels like years and *checks when Undertale was first released* well I guess I have been hearing about Undertale for years. It’s an RPG, first released on computers but eventually ported most everything else. I picked it up for my Vita a couple nights ago on a whim (I know, it was on sale on PSN two weeks ago, should have jumped on it then but for some reason I feel less bad about missing a sale when I’m picking up an indie game. Every other time it’s like “howwww could I have missed out on this sale whyyyyy am I so terrible with money” but in this case it feels karmically OK). Trying to scratch that RPG itch as an adult who plays a lot of video games not just as a hobby but also as a job is a difficult prospect. I’m jaded now. I’ve been exposed to a lot of very good writing, not just in video games but in media in general. Games need to do something different if they’re going to hook me or get me invested in them- otherwise they join the digital graveyard of the literally hundreds of games I’ve started, played for a few hours, then discarded. I want to be surprised by characters and plots, not just see and play the same stuff over and over again. Even E3 doesn’t really get me hyped. Wow, another Assassin’s Creed. Gee, another Halo. Wouldn’t you know it, Battletoads is getting some kind of a reboot. Video games used to have this crackling intensity- not like I was around during the heydey of indie game development, or there to experience the magic of Super Mario Bros. and I certainly don’t want to disparage all the incredible new ideas that are constantly being created by AAA publishers and indies alike. Obviously there’s a lot of great stuff out there and I get that games are an iterative medium. I think Shadows Die Twice is going to be my favorite game, even though it seems to be Bloodborne filtered through Kurosawa with a dash of horror. The best games in a generation are often sequels; God of War impacted me deeply and Nintendo has built an empire on sequels that riff off of what came before. What I’m trying to say is: I love video games but I also wish they were better and took more risks. Undertale takes some freaking risks. I hate spoilers, so I won’t indulge in them right here. Maybe when I finish the game I’ll do a post to talk more about the story. So far, I’m loving the modern take on combat that questions the core mechanics of every great RPG. The humor is an amazing mix of incredible smart and incredibly dumb. I fought a dog in armor and defeated it with pats. Every time I hit a save point, my character is “filled with determination” and I snort-chuckle. The music is that elusive, perfect kind of RPG music. It’s difficult to believe that the majority of the game was made by just one person: Toby Fox. For every big-budget game that employs five hundred people for years on end, there are a dozen passion projects that live on graph paper and journals and in the minds of creators. It can be hard to realize a dream or even to say it out loud. But for games like Undertale to happen, you’ve got to take a risk. Trust that your weird sense of humor will make someone laugh, and believe that yes, you can make a game with a very limited understanding of Maya or Unity. If 8-bit art is your thing, play on that. If you love point-and-click, start making story flowcharts. Playing Undertale is a lesson in quiet inspiration and I can’t wait to continue playing it.